Vatican City, Jun 28, 2018 / 05:11 am (CNA/EWTN News).- In his latest move on the Chilean clerical abuse crisis, Pope Francis has accepted the resignation of Bishop Horacio del Carmen Valenzuela Abarca of Talca, and Bishop Alejandro Goić Karmelić of Rancagua, both of whom have come under fire for their reaction to abuse allegations. Valenzuela, 64, is one of four bishops formed by notorious Chilean abuser Fr. Fernando Karadima, and has long been accused by victims of covering up his mentor’s crimes. Goić, 78, is over the typical age of retirement for Catholic prelates, which is 75, however, in May he admitted to dropping the ball on abuse allegations brought to him last year. He apologized for having not looked into the charges, and suspended several priests who were accused by Chilean media of inappropriate sexual conduct with minors. 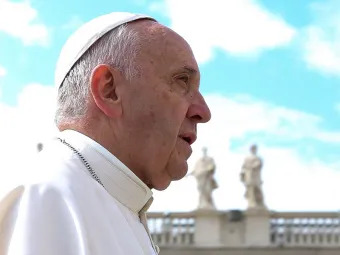 Pope Francis’ decision to accept their resignations was announced June 28, and comes nearly six weeks after every active Chilean bishop offered a written resignation to the pope following a three-day meeting with him at the Vatican in May to discuss the nation’s abuse crisis. Stepping in as apostolic administrator of Talca, where Valenzuela has served since 1996, is Galo Fernández Villaseca, auxiliary bishop of Santiago. The apostolic administrator for the Diocese of Rancagua, which Goić has led since 2004, will be Luis Fernando Ramos Pérez, also an auxiliary bishop of Santiago. With Valenzuela and Goić included, there are now five Chilean bishops who have officially stepped down since presenting their resignations to the pope during their meeting in May, including Bishop Juan Barros, who had been at the center of the nation’s abuse scandal. Earlier this year Francis summoned Chilean bishops to Rome following an in-depth investigation and report into the Chilean clerical abuse crisis carried out by Maltese Archbishop Charles Scicluna and Msgr. Jordi Bertomeu of the Congregation for the Doctrine of the Faith in February, resulting in a 2,300 page report on the scandal. The crisis flared up with Pope Francis’ appointment of Barros to the Diocese of Osorno in 2015, which was met with a wave of objections and calls for his resignation. Dozens of protesters, including non-Catholics, attempted to disrupt his March 21, 2015 installation Mass at the Osorno cathedral. Opponents, including many of Karadima’s victims, were vocal, accusing Barros, Valenzuela, and two other Chilean bishops who had been close to Karadima – Andrés Arteaga and Tomislav Koljatic – of cover-up. In 2011 Karadima was found guilty by the Congregation for the Doctrine of the Faith of sexually abusing several minors during the 1980s and 1990s, and sentenced to a life of prayer and solitude. Since then, he has met with two rounds of abuse survivors in addition to his meeting with Chilean bishops, and has sent Scicluna and Bertomeu back to Osorno to offer support and to educate in “best practices” for the handling of abuse accusations. Vatican City, May 4, 2018 / 04:46 pm (CNA/EWTN News).- Prayer, poverty, and patience are essential to living religious life, Pope Francis said Friday to a gathering of consecrated men and women. 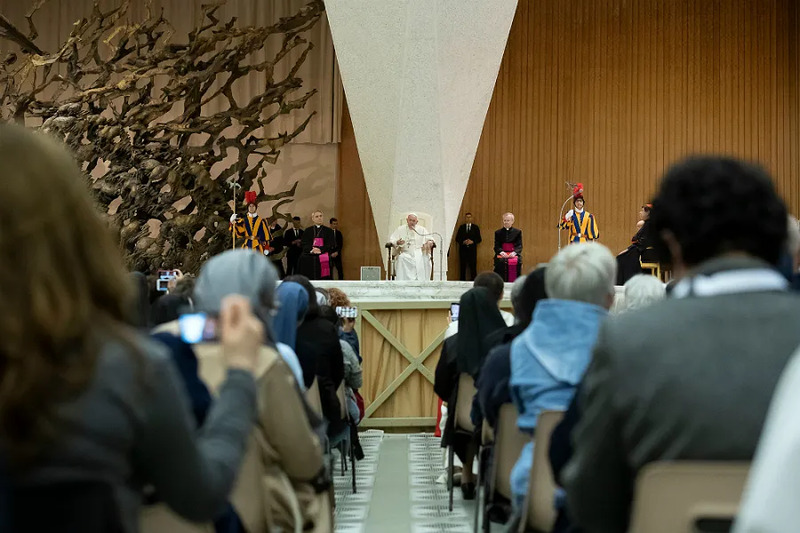 The pope set aside his prepared remarks and spoke extemporaneously May 4 at the Vatican’s Paul VI Hall to some 700 participants in a conference organized by the Congregation for Institutes of Consecrated Life and Societies of Apostolic Life. He was reflecting on discernment and how to avoid losing oneself among worldliness and provocations. Francis posited that the Holy Spirit wants prayer, poverty, and patience to stay strong in consecrated life. For the consecrated person, prayer is “turning always to the first call … to that Person who has called me,” he said. Pope Francis reiterated that for the consecrated person prayer is a return to the meeting with the Lord in which they were called by him. “And prayer, in the consecrated life, is the air which makes us breathe that call, renew that call. Without this air we could not be good consecrated persons. We would be perhaps good persons, Christians, Catholics who do many works in the Church, but consecration you must continually renew, in prayer, in an encounter with the Lord,” he said. CNA contacted the Holy See Press Office about these unclear remarks concerning prayer and those living in the world, but did not receive a response by deadline. Another reason prayer is so important for men and women in consecrated life, he said, is that it helps to direct action to the correct purpose, keeping the focus on God, instead of just serving an institution or one’s own interests. Pope Francis then turned to poverty, which he noted St. Ignatius of Loyola called the mother of consecrated life. “Without poverty there is no fecundity in consecrated life,” he said. The spirit of poverty is necessary for discernment, and is a defense against all that would destroy consecrated life. Even in religious life there can be a worldliness, the Pope said, which comes from a lack of poverty; vanity; and pride. 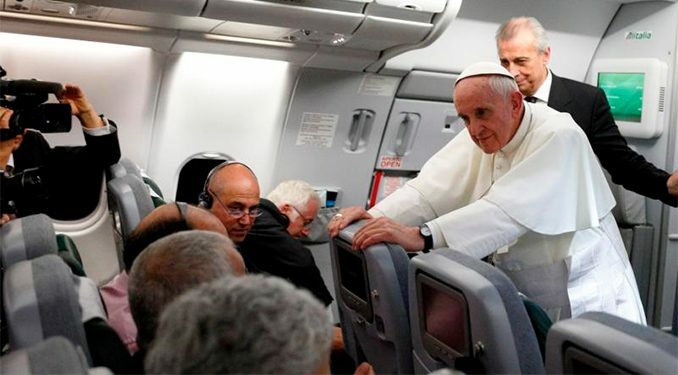 Internal struggles in a congregation and careerism at general chapters are attributable to impatience, the Pope said. There must even be patience in the face of a lack of vocations, he added. Choosing to stop accepting members and to sell off the community’s property is a sign that the congregation “is close to death” and has become attached to money, rather than having the patience to pray for new vocations. The pope concluded by telling the consecrated men and women that they will surely be fruitful if they are prayerful, poor, and patient.